Childhood is such a special time where kids are learning about the big and beautiful world around them. Many kids love to learn about animals and the natural environment, and the team at Dingo Den Animal Rescue would love to provide your children with opportunities to learn! We are developing a growing library of free educational resources that will inspire kids to learn more about our beautiful native ecology, and provide a whole lot of fun and entertainment at the same time! Keep an eye on this page as our library continues to expand. Remember, all our resources are free - the way education should be - so please download and share with your family and friends. Remember Chatter Boxes? Well they're back! 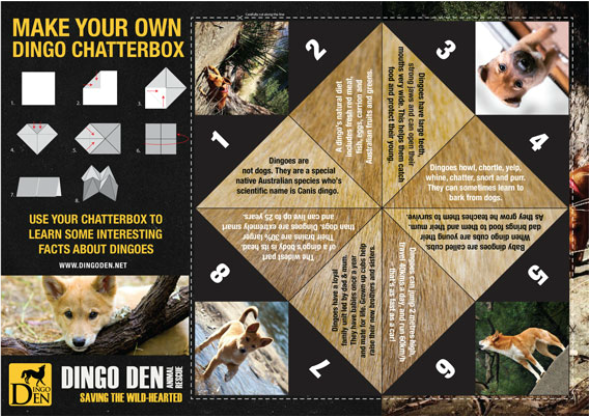 Our Dingo Den Animal Rescue Chatter Box is full of bright pictures and interesting information to bring a smile to your kid's dial while learning about our beautiful Aussie canid. Click the Download File button below to get a hold of our free resource that you can print and give to your kids. They'll be wrapped with their new dingo chatter box that they've created themselves. Be sure to share with family and friends! Written by M. Shipley and illustrated by Noela Young, The Old Black Dingo is a touching short story about a dingo who's life is changed by a young sheep dog. Beautifully illustrated, this story will help children understand the challenges native animals experience with loss of habitat and food sources, and provide context around land management issues. A must-read for kids and parents alike, this story will touch your heart. Click the Download File button below to get your copy of this heartfelt classic.